Just weeks ago, former Prime Minister Mahathir Mohamad contrasted the development of China and India. As reported, he praised the single-mindedness of the Chinese government in developing the country and ridiculed the Indian government for being far too democratic and not focusing enough on development. He went on to state that freedom hurts the economy. Art Harun, a columnist at The Malaysian Insider replied to this in his column stating examples where democracies have been successful, contrary to the former Prime Minister’s assertion. Zaidel Baharuddin, yet another The Malaysian Insider columnist jumped into the debate at his blog by defending the former Prime Minister, stating that “starving hard working farmers in India who has to fight drought and fertilizer prices don’t give a damn about freedom of speech or expression.” Art Harun took the chance to reply to the point and various other comments too diverse to cite here by arguing that economic prosperity does not have to be mutually exclusive with respect to freedom as well as adding that they are other factors that need to be considered in the determination of economic development, like leadership. Indeed but all those discussions are gradually veering off course from the point the former Prime Minister made, about how democracies perform poorly against less democratic states in terms of economic development. This point is not necessarily true. If one wants to make that point, one cannot choose two data points and make a conclusion out of it. That is the logical fallacy of hasty generalization. A better way is to take all of democracies and all of authoritarian states and compare them. Political regimes have no impact on the growth of total income when countries are observed across the entire spectrum of conditions. Contrary to widespread concerns, democracies do not reduce the rate of investment even in poor countries. It appears that when countries are poor there is little governments can do, so that it makes little difference for economic growth whether rulers are elected or hold power by force. In wealthier countries, patterns of growth are no longer the same. Dictatorships rely on the growth of labor force and on keeping wages low, while democracies pay higher wages, use labor more effectively, and benefit more from technical progress. But while growth under wealthier dictatorships is more labor-extensive and labor-exploitative than under wealthier democracies, so that functional distributions of income are different, the average rates of growth of total income are about the same. Less-democratic countries do seem to have variable growth rates and policies than more democratic ones. This corroborates the conjecture of Sah (1991). Possible explanatoins for this fact can be found in Rodrik (1999a) and in Sah and Stiglitz (1991). The evidence presented in this paper strongly supports Sah’s conjecture. The empirical results are unaffected by many robustness and specification checks. The results are not sensitive to specific time periods, to different democracy indicies, to different econometric procedures, or to model specification. The results hold even after controlling for many plausible determinants of growth rates and democracy indicies, including the usual variables from the empirical growth literature, time dummies and country-fixed effects, GDP, natural resource dependence, and OECD membership. Of note is the relationship between wages and democracy indices as reported by Rodrik. People in the Najib administration may well take that into account. 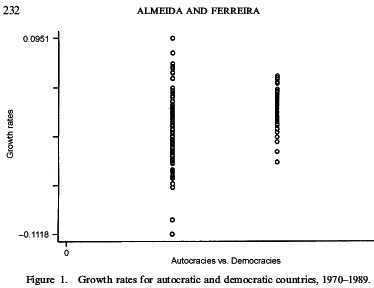 Autocracies are represented on the left side and democracies on the right side. Note the variances and the means. Bottom line is, there is more risk to having an authoritarian regime than a democratic one, in terms of economic development. If one wants to be more certain about achieving success, democracy is one of the ingredients one must consider. — Dr Mahathir singled out India as an Asian country that “made the mistake of being too democratic” and compared it unfavourably with China’s authoritarian regime. He expanded on the theme at a press conference later, saying that people “don’t understand the limits of democracy”. “Democracy can be a hindrance to progress because you spend so much time politicking that you don’t have time to develop your country. “In China, there’s not much politics. So, they can spend more time developing their country. — Yes. According to DrM, the Westerners are wrong for making democracy and freedom the cornerstone of progress. The British are so free they go on strike every other day. Well, who sent people to the moon in 1969? Which part of the world had an industrial revolution? Why have Russia, East Germany, Romania et al embraced democracy and freedom? From whom did we buy our Scorpene? Why Glasnost and Perestroika? So the people know the limits of freedom and how to behave themselves properly and in accordance with the Government’s code of behavioural acceptance? And finally, according to Dr M, apart from China, Japan, South Korea and Taiwan will lead the Asian charge. — I’m pretty sure, those starving hard working farmers in India who has to fight drought and fertilizer prices don’t give a damn about freedom of speech or expression. It is those comfortably well paid lawyers with some extra time on their hands who are more concerned about these things and write about it. — My question is, why can’t we have them all? Especially in a democracy, where we elect our so called leaders to look after our well being as members of a State? I think in this day and age, it is downright insulting — and not to mention, pathetic — for any leader to say to the people that I will give you food on your table in abundance but you would have to shut up, toe the line and do as I say, all the time and under all circumstances. For a leader to lay the blame on the people which he or she ruled — for not understanding the limits of democracy — as a reason for his or her failure to achieve development and progress does not speak much of his or her leadership. A comparison was made with Singapore in one of the comments. It was pointed out Singapore did not have much of a democracy and they progress well. But that does not prove that Singapore progressed well because it was less democratic. The lovely thing about Indian history is that, in making a comparison between authoritarianism and democracy – you can. The tail end of Indira Gandhi’s government was pictured by authoritarianism (the State of Emergency between 1975 and 1977). High growth rates didn’t follow. She called for elections, expecting the electorale will vindicate her rule – but was booted out. Her authoritarian tendencies returned when she became Prime Minister again – and the rupee also lost 40% of its value. Its only her son that started losening the strings to democratic and economic freedoms. The escalate corruption and abuse of power in China are not told, especially in Malaysia mainstream media. The poison milk incidents are just tips of the iceberg. It is just too early to say “China is successful”. If one remember, the west world financial analyst use overwhelming praise and cover the problem under the carpet. If one remember how the “4 little dragon” and “4 little tiger” hit by economy crisis in 97.